Superior quality now comes with superior taste! Our flavor experts ensured you'll enjoy 100% Whey Protein's taste as much as your results. Great taste and macros! Love the product! By far in my opinion EVL carries the best supplements. This protein not only tastes good, but look at the micros! It blends really easy and it doesnt make you gassy like most proteins. Tastes good and mixes well. Extremely happy to have the original taste back. There for a while no flavors existed without a terrible after taste. HOWEVER, I absolutely love this protein. I also take the BCAA capsules along with the Recover Mode. I can't say enough about these products. Everything taste amazing and is very effective. I have been drinking this protein powder for well over 2 years now and I don't see me changing any time soon! The Vanilla flavor tastes really good even with water and doesn’t clump up definitely would recommend. I have been using EVL whey for some time, I am an picky person when it comes to what I put in my body, and I am very pleased with this particular brand and their products. I love that their double rich chocolate is not loaded with (bs) and unnecessary crap to offset the flavor. Tastes delicious right after a great workout and even between meals as a meal replacement. I have been buying this product for over 4 months now and I will continue to do so. I have noticed after my long workouts im not as sore, due to my great balance of food intake and EVL right after my workout and between meals.. Great balance of BCAAs. 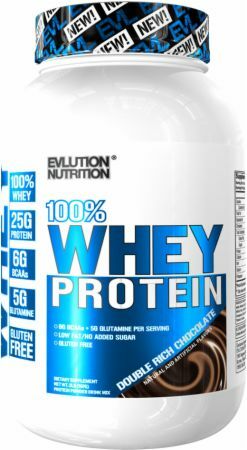 And for the record for who expect this product to turn u into a muscle machine overnight well I got bad news .if u want to build muscle, you have to eat, eat, eat.. suppliments can only do so much and EVL whey is a fantastic product for growth if taken correctly. It is a v.good protien that i was used with good solved in water and good tast. The chocalate peanut butter is a great flavor. The fact that is has BCAA already included is a great added bonus! Amazing protein, chocolate decadence is one of the best chocolate flavours out there probably. 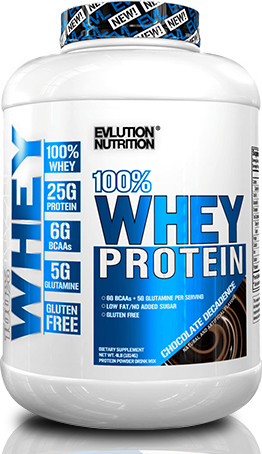 EVLUTION NUTRITION 100% Whey Protein is my go to choice for protein for the last two years, mixes well, great taste, plus it has bcaas & glutamine. Great product! Pretty good taste and mixes well. Absolutely delicious. Flavor is 10/10 and mixes perfectly. Never had a bad quality EVL product. Always highly recommended to friends and family! I've tried a few different flavors of the various EVL protein powders & am very impressed. They taste fantastic--truly a "milkshake" richness like they advertise. The mixability is about the best of any protein out there, with minimal clumping. I like that this protein is low in carbs & calories, plus the good supply of glutamine helps in recovery. Directions: Add 1 rounded scoop of STACKED PROTEIN® 100% WHEY to 6 oz of your favorite liquid such as water, skim milk or unsweetened almond milk. Stir with a spoon or shake in a cup for 15-20 seconds until protein powder fully dissolves. Warnings: Before consuming STACKED PROTEIN® 100% WHEY seek advice from a physician if you are unaware of your current health condition, have any pre-existing medical condition, taking any medication, planning any medical procedure, contemplating pregnancy, pregnant, or nursing. Reduce or discontinue use if any adverse reactions occur such as but not limited to gastrointestinal discomfort. STACKED PROTEIN® 100% WHEY is only intended to be consumed by healthy adults 18 years of age and older. Keep out of reach of children and pets. Store at room temperature. Notice: Use this product as a food supplement only. Do not use for weight reduction.